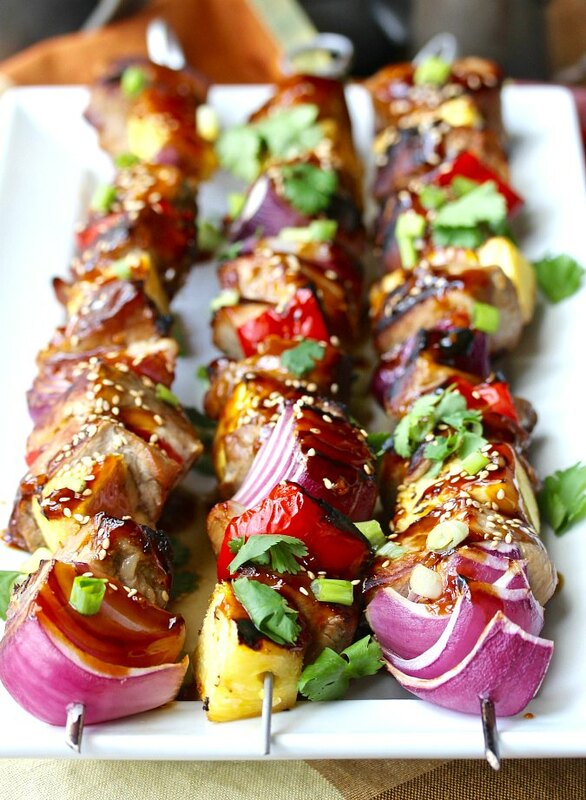 Grilled Teriyaki Pork Kebabs with pineapple, peppers, and red onions flavored with homemade teriyaki sauce and grilled to perfection. 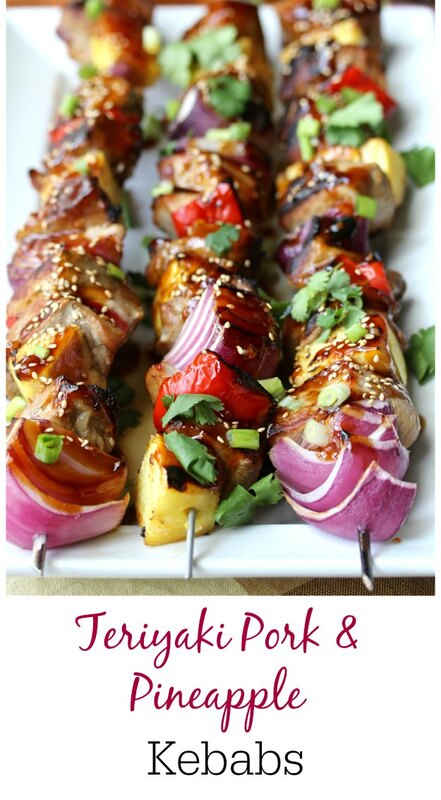 The pork for these grilled teriyaki pork kebabs is marinated in a teriyaki sauce that is deeply flavored with nine ingredients, and then grilled, brushed with more reserved sauce, and sprinkled with toasted sesame seeds and scallions. They are totally delicious. I made these teriyaki pork kebabs on the grill, but you can also make them in the broiler, which, if you think about it, is an upside down grill. The trick to kebabs that include both meat and produce is to choose produce that won't turn to mush before the meat is fully cooked. I used big chunks of red onion, pineapple, and slices of red bell pepper, and they all held up beautifully. For the pork in this recipe, I used pork shoulder, but you can experiment with other cuts of pork. If you want to grill vegetables that are more tender, such as tomatoes and mushrooms, you can use dedicated skewers for the vegetables and pork, grilling each "food group" separately. I've been on a kebab kick lately. They are so easy to grill and you get a complete meal on a stick! Just last month I made these lamb shish kebabs and these scallop and bacon kebabs. So good. This month, the Fantastical Food Fight is all about kebabs. July is national grilling month, and we are celebrating with kebabs. If you like kebabs, be sure to check out all of the links to recipes below. In large measuring cup or medium bowl, whisk together the soy sauce, dark soy sauce, 3/4 cup water, honey, rice vinegar, mirin, sesame oil, ginger, and garlic. In a one gallon zip lock plastic bag, add the pork and 1/2 cup of the soy sauce mixture. Marinate the pork in the refrigerator for at least an hour, and up to 16 hours. If you are using wooden skewers, soak them in water for at least 30 minutes right before grilling. Add the remaining soy sauce mixture to a 2 quart saucepan. Mix the cornstarch with the remaining 2 tablespoons of water in a small bowl. Bring the soy sauce mixture to a boil over medium heat and boil for one minute. Whisk in the cornstarch/water mixture, and cook, stirring constantly for about a minute, until the sauce thickens. Remove the sauce from the heat and set aside. 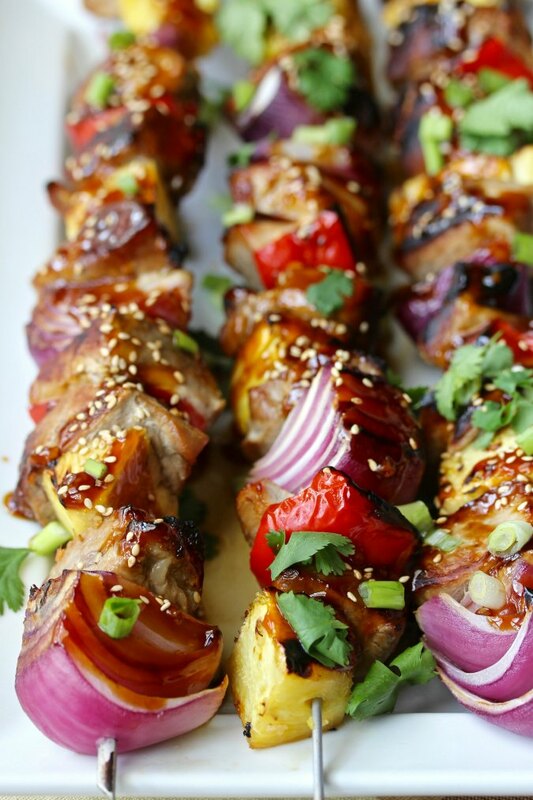 Thread the pork, pineapple, onions, and red bell peppers onto the skewers. Prepare your grill for medium-high heat grilling, and oil the grates when ready. Add the skewers to the grill, and cook, uncovered, about 3 minutes per side. Turn the skewers again, and cook until the meat reaches 145 degrees F.
Remove the kebabs from the grill to a clean baking sheet or tray, tent with foil, and let rest for about 5 minutes. Brush the kebabs with the sauce and sprinkle with the sesame seeds, scallions, and cilantro. Serve any extra sauce on the side. Pork is one of the things I skewer most often. These sound delicious. I love that you use cilantro in this...I can just imagine the flavor it adds! it definitely does. I'm lucky to have the cilantro favorable gene. Yum yum yum! I also enjoy making pork kebabs (like Wendy) :) It took me until I was preparing for this Food Fight to realize that it's better to separate veggies that cook faster/slower than your protein and skewer them separately. It makes sense, but I don't think I've ever seen anyone (in my real life) do it that way. I love the trick Wendy used in her kebabs where she par cooked her potatoes.